The left and center of this country used to think that the biggest calamity to befall the country was half of the population thinking Trump would be a good president. That’s no longer news, because it’s been bumped off the top spot by something even more depressing: close to half the country actually thinks he’s doing a good job. I feel like the left is criminally out of touch with how half of the country thinks, and that’s a real problem. I think most of the left still believes that this massive mistake was made, and that everyone hates Trump but it’s too late to do anything about it. So now we’re stuck with him. But, as of today, 43% of the country isn’t stuck with anybody—they’re liking what they see. Every once in a while I hear something he’s doing that I agree with, which is usually around breaking up some horribly maligned system that has been impotent and corrupt for years or decades. Trade with China is one. Can’t remember any others. But most everything I hear from him generates physical wincing, like I just swallowed a mouthful of rotten meat that I know is going to make me sick for days. The budget where he cuts a whole bunch of things that have very little cost, and adds to the one thing where we’re spending too much. The inability to act like a human, let alone a U.S. representative, when talking to foreign leaders. The healthcare move. What he’s doing reads to me as 10% positive, “shake it all up” vibe, mixed with 90% botched and horrible. Oh, and the conflicts of corrupted interest. Anyway, that was a tangent. My point is that the real problem isn’t Trump. 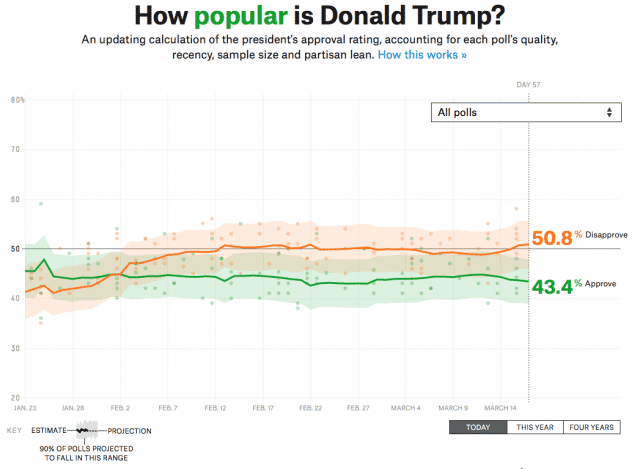 The real problem is that half the country thinks he’s doing a good job.